We kicked off this year’s celebration of Halloween last week with pumpkin carving in the TD courtyard and the Escape the Forbidden Tomb game in the Rosenfeld Hall basement. The TD Dining Hall will continue the Halloween festivities with their own pop up event so make sure to get to dinner this Wednesday evening! Our “photo of the week” captures the amazing dinner we had after our tea with Australian violinists Eddy Chen and Brett Yang, otherwise known as TwoSet Violin. 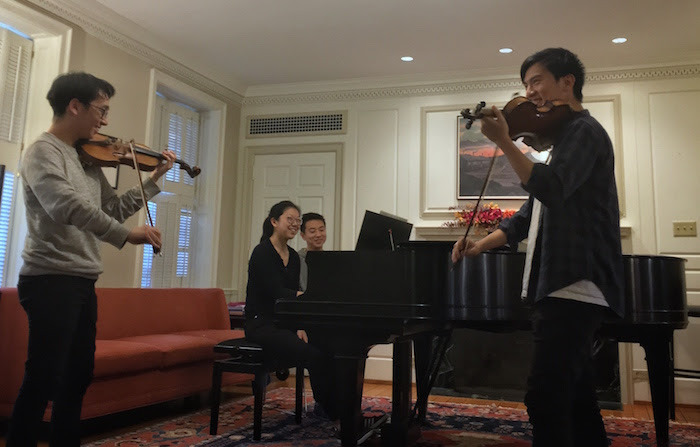 The two generously talked about their careers as classical musicians and comedic Youtube videomakers as well as performed their signature “Concerto Battle” and Pablo de Sarasate’s “Navarra.” They were accompanied by our own TD dynamic duo of first-year pianists, George Hua and Caroline Ho. Speaking of special TD events, you have just this week to sign-up for the Chubb dinner on 11/7 with award-winning graphic novelist Gene Luen Yang. The lottery will close on Thursday 11/1 at 12pm and we’ll announce the TD guest list by Friday 11/2. And what a great turnout for our Fall Formal! Congratulations to our SAC leaders – TD sophomores Sarah Cameron and Ryan Tsedevsuren– for putting together a very fun event at Box 63. While we still miss Anna Liffey’s it’s great to know we can bring the TD fun just about anywhere we go! It’s been awhile since we have had an IMs update… According to our head IM Secretary Max Yuhas ‘20, TD is currently in first place for the Tyng Cup race… just ONE point ahead of Saybrook!!! The IMs energy has been intense this year so let’s keep it going. Max and Angel Mora ‘21 have vowed to shave their heads into a “TD design” if we win the Tyng Cup! Now that is dedication!!! 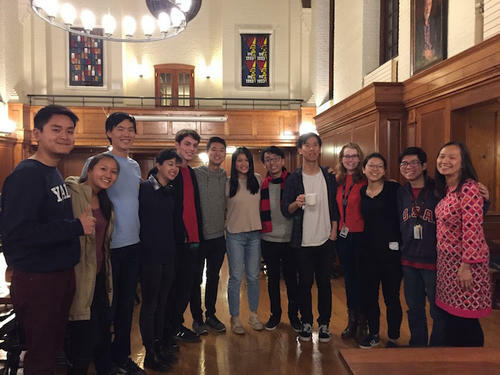 Once we get past Halloween, the Mott Woolley Council will be working with our Harvard sister college, Leverett House, to host TD students for the Harvard-Yale Game. We will send out a separate email with housing info for the big game. Please stay tuned! Dean Chun will be dining with Yale students at our dining hall today. All students attending this lunch have been notified. Come support TD in the IM Soccer Final as we face off against our oldest rival: Silliman!!! A rematch of last year’s semifinal, the winner will get to play the Harvard IM champion on November 15th. Please meet in the courtyard at 3:30 pm to catch the bus of victory from PWG! Feel free to email soccer team captain angel.mora@yale.edu for more info! To support our wonderful Sibs program, TD is hosting a Sibs Night in the RH Common Room with hot apple cider and cookies. Our coordinators, Melina Delgado and Alanna Pyke, have already confirmed the time with the 8 Sib groups who signed up for a free slot to play. Even if you didn’t manage to get a free slot, come hang out with your sibs and enjoy the Halloween snacks! We have a few spots remaining for dinner with James Duderstadt, eminent professor of engineering and nuclear science as well as the former President of the University of Michigan (1988-1996). The dinner will be co-hosted by TD juniors Won Jung, Max Yuhas, and Leah Smith. To reserve your spot, please write to me directly at mary.lui@yale.edu. Great way to relieve midterms and have some fun! Sign up in the Head of College office and pay $10 to secure your spot. Sign ups will close on Tuesday 10/30. The bus leaves at 11:35am on Saturdaymorning from the Temple Street gate and will return to campus around 4pm. Make sure to bring comfortable clothing that you don’t mind getting very dirty. You’ll want to dress in thick layers to stay warm and cushion those splattering paintballs! For more information, please email angel.mora@yale.edu. Each moment convokes an actual fate. Whatever is remarkable is nicknamed. On a smaller scale are yet quiveringly real. Here, there is no such thing as a beggared day. And yet as much a mystery as luck. The meaning that cannot be awe-struck. The unpredictable, adroit rhyme of it all. Thinking about post-graduation opportunities? Come hear more about the Yale-China Fellowship and how it could be a transformative, life-changing experience.